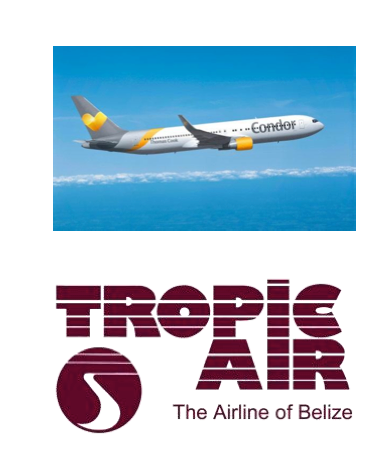 Condor Flugdienst GmbH, Frankfurt am Main, Germany, December 8, 2014 – The leisure airline Condor now includes the Belize airline Tropic Air as one of its partners with immediate effect. Flights from Tropic Air can be booked via the existing destination Cancun (CUN) as an enhancement to the network of flights offered by Condor. As set out in its current 2014/15 winter flights schedule, Condor regularly flies to Cancun (CUN), Mexico from Frankfurt (FRA) on Tuesdays, Wednesdays, Thursdays, Saturdays and Sundays and from Munich (MUC) on Mondays and Fridays. Onward flights to Belize (BZE) with Tropic Air are available on a weekly basis on Saturdays. A return flight from Belize can be selected on a flexible basis as the connection via Cancun to Frankfurt or Munich and on to destinations throughout Europe is available daily. Belize lies on the Caribbean coast of Central America bordering onto Mexico and Guatemala. The Belize Barrier Reef - the second-largest coral reef in the world - and the famous Great Blue Hole make the small Caribbean nation a veritable paradise for divers. Anyone wishing, by contrast, to immerse themselves in an exciting and fascinating culture can retrace the footsteps of the Maya, whose descendants still live in the country to this day. Condor Flugdienst GmbH has been flying its passengers to the world’s most beautiful holiday destinations since 1956. On an annual basis, more than 7 million passengers fly with Condor to around 75 destinations in Europe, Asia, Africa and America. Since 2013, the German airline Condor, is part of the Thomas Cook Group Airlines to which the Thomas Cook Airlines UK, Thomas Cook Airlines Belgium and Thomas Cook Airlines Scandinavia also belong. The fleet of the airlines in the Thomas Cook Group comprises 90 modern and environmentally friendly aircraft, of which 40 aircraft are in the Condor fleet: 12 Airbus A320s, 3 Airbus A321, 13 Boeing 757-300s and 12 Boeing 767-300s. The aircraft are maintained by the airline’s own technical operations. In a representative survey of Focus and Focus Money, called “Mit gutem Gewissen”, Condor was elected the most environmentally sustained airline and received the sustainability prize in 2014. Condor is co-initiator of the four-liter-campaign of the federal association of German aviation (BDL): German aviation consumption of kerosene is less than 4 liters per passenger on 100 kilometers.